Jodi Rogers, our illustrious wizard of special events at the Cambie Liquor store, has been poking fun at us of late. “You guys are just all about wine, aren’t you?” she said to me when I bumped into her a few weeks ago. “You never come to any of our other tastings – it’s just wine for you two.” We laughed as she looked pointedly at my shopping basket brimming over with bottles of Rioja, Riesling, Douro, and a couple of the Gruner Vetliners we’ve both fallen hopelessly in love with. So this weekend, with Frank not yet back from his pre-holiday business trip, I figured I’d roust myself out of this apparent complaisance and made tracks to the 41st and Cambie LCB store to check out Jodi’s Indian Summer Cocktail event. I had no idea what an Indian Summer Cocktail actually is other than it is not made with wine. Turns out it was the most delicious decision I made all weekend. A delightful ruby red, this sipper was created at Watermark on Kits Beach – a local restaurant with great food, spectacular ocean views, and an innovative outlook on fine cuisine and cocktails. It’s made from equal parts Mangalore Liquor, aloe juice, and cranberry juice, and even in plastic glasses it looks quite wonderful. Mangalore liquor, I discovered, is an unexpected, spicy blend of pepper, cinnamon, and cardamom. It danced across my palate and then took up residence with a long, lingering finish. This is a cocktail that would definitely take a star role when paired with hot Indian or Thai food – hardly surprising since this drink is one of southwest India’s most popular. Mind you, the four chocolate bonbons that accompanied this tasting would officially qualify as a yummy pairing – not that I have a chocolate fetish… well not much. 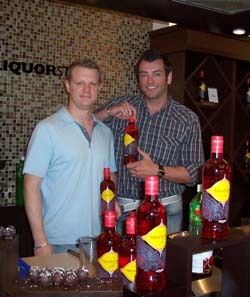 “And try adding just a splash of vodka,” suggested Watermark’s junior bar manager Brian Davies (shown right along with assistant David Simes who were both happy to pose so I had photographic evidence that sometimes Frank and I really aren’t “just about wine”). A bottle of Mangalore is $39.95, a bargain when you consider that with a 40% alcohol content, you’re likely not going to use more than one ounce per drink. PS: Jodi, you would have been proud – this trip, I really did walked out of the store with something other than wine in my basket. This entry was posted in mangalore, thai food and tagged Cocktail, Davangere, Douro, Ian Chappell, India, Karnataka, Mangalore, Wine. Bookmark the permalink.